The Miami Heat made headline-grabbing moves in the summer of 2003. The most notable was drafting rookie Dwyane Wade. Miami also signed free agents Lamar Odom, Rafer Alston, Samaki Walker and Bimbo Coles. But one move that didn’t attract as much attention came on Aug. 6, 2003, when the Heat signed an undrafted local kid to a one-year contract paying $366,931. His name was Udonis Haslem. Sixteen years and three championships later, Haslem has played in more regular-season games (852) than anyone in franchise history except Wade. And while Wade will call it quits after the 2018-19 season, the team’s 38-year-old power forward hopes to play with the Heat next season. “Once you walk away and you can’t play no more, you really can’t play anymore. 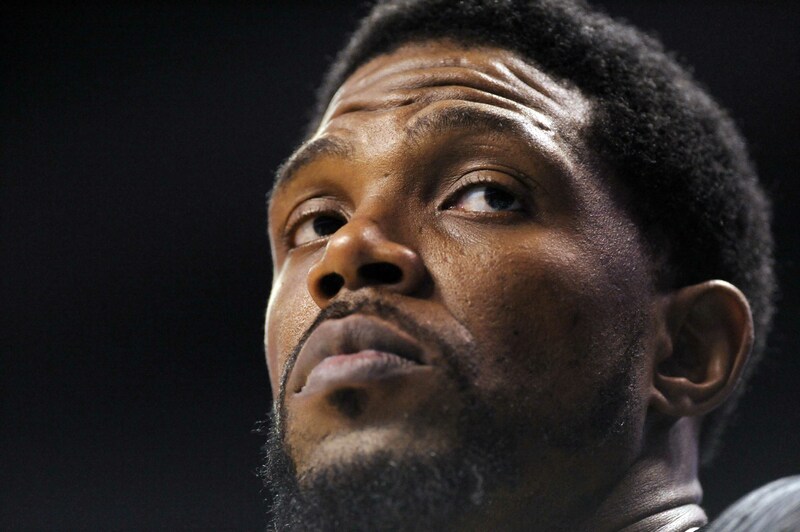 So while I can, I want to be around it,” Haslem told The Undefeated. 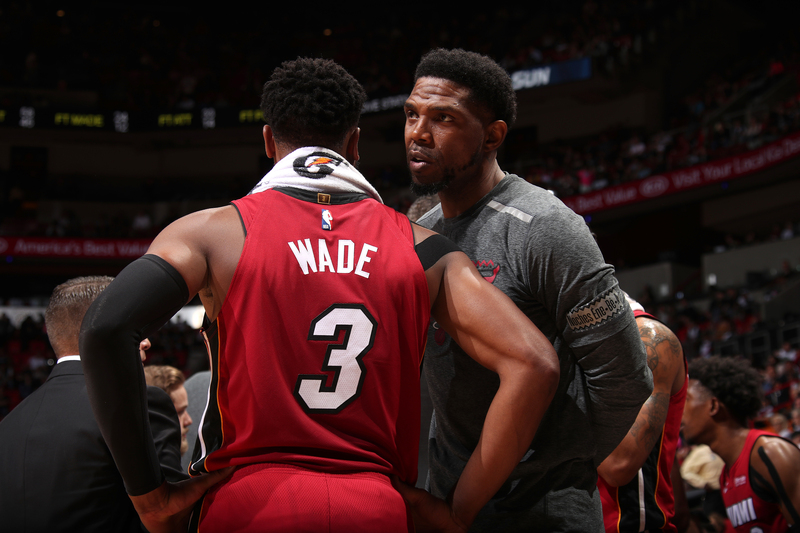 Haslem, who was named a finalist for the 2018-19 Twyman-Stokes teammate of the year award, recently took time to reflect on his life and career in Miami — a journey that has included overcoming difficult challenges. Here are the reflections of “Mr. 305,” as told to Marc J. Spears, on growing up in Liberty City, going undrafted, and the lessons he learned from Wade, LeBron James, Shaquille O’Neal, Pat Riley and others. Power forward Udonis Haslem signed with the Miami Heat in 2003 and has played in more regular-season games than anyone in franchise history except Dwyane Wade. South Beach is not Miami. It’s a whole different ballgame when you cross the bridge. I had never been to South Beach until I got into the NBA. For us, we were always told that we weren’t supposed to go over there. Why would you be over there? People from where I was from in Miami, Liberty City, we went out to the beach. It was a different beach; it wasn’t South Beach. When you think about Liberty City … I wouldn’t say it’s bad, but there’s a lot of bad that can happen, opportunities that go around where you can make bad decisions. One mistake could cost you your life, could cost you your freedom. I see it every day. I lost a lot of friends. I got too many T-shirts at my house with people’s faces on them. Way too many. I remember, maybe 2014. Me and my wife had just moved into a new condo, and I was moving stuff around. And I came across all my ‘Rest in Peace’ T-shirts. I kind of broke down in tears. I was telling my wife, ‘I don’t know if I’m gonna have any friends left. Who’s gonna be left?’ All the people I hung around, literally dead. My best friend Chip, dead. ‘Fat Frank,’ dead. All these people I grew up with, gone. If you talk to people that know me, I was one of those kids that could’ve went the other way. When I talk about people that I know or people that I grew up with, I’m not just talking about guys that steal bubblegum out the store. I’m talking about real dudes, real street dudes, man. Murder, drugs. I know guys that are down with all that. When I got to college I met people that had never seen a crackhead. I thought something was wrong with them. I was like, ‘Y’all never seen a crackhead?’ I saw them every day. I thought that was the norm. My mother struggled with drug addiction and homelessness and just a lot of different things. I didn’t really grow up with my mother. So the time that we actually started to patch our relationship up, become mother and son like we should’ve been all along, cancer struck and things just got worse. But my mother was the strongest person that I ever met. There are so many people that get lost in the streets. Drugs, violence, homelessness, prostitution, all those things that she went through, she came back from that. She cleaned her life up. She was a testimony to other people that was going through that. Going to the shelter, speaking to people, encouraging people, trying to pull people out of the hell that she was in. So, for me, hands down, the strongest person I ever known. But it was pretty much ‘takes a village to raise a kid’ with me. It was my stepmom and my dad, but in all honesty, it was my stepbrothers, it was my stepsisters, it was everybody. I was the kid that needed a lot of attention. I always had the right intentions, but the things just never always came out right. I made my mistakes. I got in trouble. Everybody got that story where they’re like, ‘I remember watching TV or riding down the street saying, ‘I’m gonna make it and this is gonna be my life.’ ’ I’m not even gonna lie to you, I never had those moments. I couldn’t see past one day at a time. So, for me, I didn’t see myself being here 16 seasons later, three championships, Heat’s all-time rebound leader, all the accolades I’ve had. I just wanted to keep my head down and keep working. For me to be here today, man, it’s by the grace of God. In 2002, I had an NBA draft party set up but I didn’t go. For me, it was like, ‘Would you go to a draft party if you didn’t get drafted?’ So I didn’t go. I was disappointed not to get drafted, probably the most disappointed I’ve ever been in my life. I had all the accolades, All-American this, records at University of Florida, went to the NCAA tournament final. I just did everything I was supposed to do as a player. I wouldn’t say it was humbling, because I was already a humble person. I still am. But it was eye-opening. Instead of complaining and whining and saying, ‘This team messed up. This team lied to me. The NBA, this and that,’ I just sort of stepped back, evaluated everything and tried to take a look at myself and what I can do. I remember coming out of college and people telling me, ‘It would help your draft status if you cut your hair.’ I had braids, and I never cut my hair, and I didn’t get drafted. And I don’t know if that had nothing to do with it, but at the end of the day, I just always felt like I never wanted to waver away from who I am or what I stood for. I got Tim Duncan one night, Kevin Garnett one night. I got Rasheed Wallace … If you don’t come with it, you can get embarrassed. So playing professionally in France for a year was a business trip. I stayed on American time because my mindset was France was just a pit stop for me and I’m going to be back in the States in a few months. I would sleep during the day in France, wake up, take my naps and stuff and then play the game. Then I’d come home and be up all night, go to practice, come home, take a nap again, eat lunch and be up all night. When I finally signed with the Heat in 2003, I still had a chip on my shoulder because I still felt like I had a lot to prove to a lot of people. It wasn’t until I won my first championship in 2006 that I finally, for the first time in my life, felt accomplished as a basketball player. I never had before. I always felt like I was the underdog. I always felt like nobody wanted to see me win. I always felt like the world was against me. I always felt like I had a chip on my shoulder. There were just so many things that I felt that was inside of me bottled up. And every time I played a game of basketball, it was the only way I was able to express it. I played the game with a controlled rage. I was always one tap away, one call away from getting called out the way I played the game. That’s just the edge I played with. It wasn’t that I was looking to get called out or hurt anybody, but that’s just the way I competed. I’m 6-foot-8. I got Tim Duncan one night, Kevin Garnett one night. I got Rasheed Wallace, Derrick Coleman, Chris Webber. I’m talking about real power forwards, not stretch power forwards that’s 6-11 and shoot 3s. I’m talking about real power forwards. If you don’t come with it, you can get embarrassed. And I feel like that’s the biggest difference between me and the people that got drafted those years and didn’t make it, is just my habits, my work ethic. It wouldn’t allow me not to make it. It wouldn’t allow me not to have some kind of impact. There are so many people out here that got so much talent. So many people out here that are smart. So many people out here that’s athletically and God-given blessed. But it’s habits, man. If you don’t have habits, then you can’t be successful. I’m always working. I stay in the weight room. It’s not just a job anymore, it’s a lifestyle. I know my body now. I know what I need to eat. I know how I need to eat. I know how I need to train. So I stick to that. Even when I retire, I’m going to stick to it. Dwyane Wade (left) and Udonis Haslem (right) both joined the Miami Heat in 2003. D-Wade, that’s my boy. Sometimes water can be thicker than blood. He’s closer to me than a lot of my family, and they always say, ‘Blood is thicker than water.’ I’ve learned from the situation with Dwyane that that’s not always true, that somebody can be closer than blood to you. We grew up the same. He’s from Chicago, but I’m from Miami. We both grew up in drug addiction homes. We both had adverse circumstances that could’ve went the other way. So we just related to each other on a lot of different levels. I’m so happy for him in his upcoming retirement. I’m happy he’s getting one last dance. I’m happy he’s getting all the praise and all the accolades he deserves. I had a chance to see it firsthand. It’s been a blessing, it’s been an honor, it’s been a privilege to share the floor with him, and I’m looking forward to continued success for him. I owe a large part of my success on this basketball team to D-Wade. What he made me do was just take a step back and witness his grind and how he’s able to get out of his comfort zone and evolve. That was something that was hard for me. LeBron James had the best basketball IQ I’ve ever seen from a player. The way I see the game now, I know everybody’s position. I know where everybody should be. I know what everybody should be doing. When I’m looking at the defenses, I’m not just looking at the man that’s guarding me. I’m looking at the other four defenders on the floor. That’s something I learned from LeBron. Alonzo [Mourning] always told me, ‘Every player in this league is one trade, one coach and one injury away from being a role player to a superstar to out of the league.’ I always took that with me. Gary Payton was one of the most competitive people I’ve ever been around. If there’s one thing that I can just take away from Gary is just his grit, his grit to dig in during certain moments in the game. Even when he came to us and he was old, he never shied away from the challenges. Head up, guarding a younger point guard. ‘I want that matchup. I want that challenge. What can he do?’ That’s something I admire about Gary. D-Wade, that’s my boy. Sometimes water can be thicker than blood. I used to be scared of Pat Riley when I first got here. Not physically scared of him, just intimidated. He is ‘the great Pat Riley.’ But he had that quote that ‘Hard work doesn’t guarantee anything, but without it you don’t have a chance.’ I repeat that a lot to kids. I repeat that a lot when I do speaking events. I repeat that a lot because I believe in it. ‘Spo’ [Heat coach Erik Spoelstra] taught me how to evolve as a basketball player and a person. The thing he always preaches is evolution. I was a stubborn person, and that was the part that made me who I am. I had my stubbornness, my grit, but you have to evolve in this game and in life. If you don’t evolve, you’ll die in your sport, you’ll die in your business. Taking different things from all these people is the key to me being here 16 years and still being able to play this game. 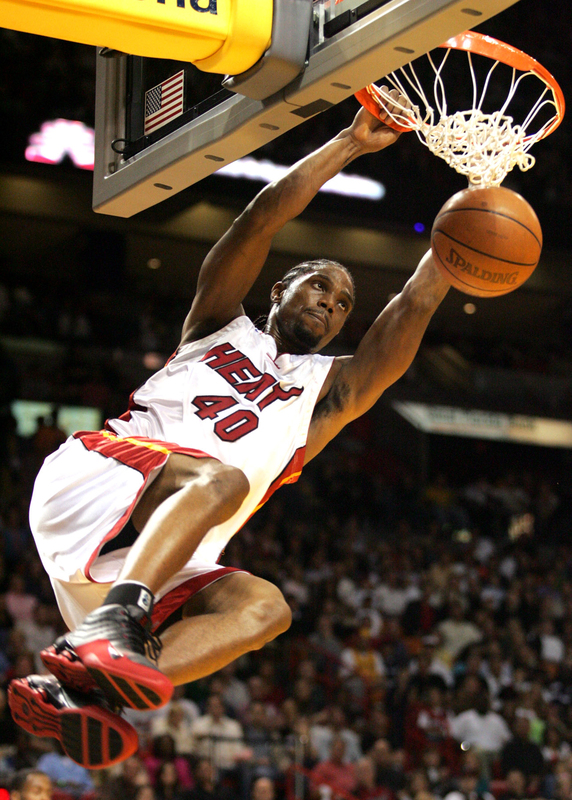 In this Jan. 1, 2005, file photo, Miami Heat’s Udonis Haslem (40) dunks during the third quarter against the Charlotte Bobcats, in Miami. Staying with Miami my whole career is probably one of the best decisions I ever made, but it’s always been one of the hardest. It’s funny how this league works, because San Antonio offered me a contract first before the Miami Heat. And once Miami realized San Antonio offered me a contract, then they came back with a better one. I’ve had opportunities to go play other places for more money, and you play this game to win and provide for your family. So it was always that dilemma where, ‘Can I win at this place? If I can’t, is it an opportunity to make X amount of dollars?’ Which at the end of the day, ultimately when you walk away from this game, that’s what you living off of. So, for me, it’s never been an easy decision. But it always came back to how I was raised. I always made moves based on my heart and what I felt was right for me and my family. I am the best father in the world. I don’t care if we land at 4 a.m. and my kids play at 7, I’m there … showing up at everything possible, trying to just make up for the time when I’m away. When I’m home, I’m present every opportunity possible. My kids are boys, so they keep you busy. My oldest son is at the University of Toledo playing [offensive] line. My 12-year-old is playing travel baseball. He’s a stud. My 7-year-old is just a beast at whatever sport he tries to play. I also put myself in a position where if I can’t play this game, what is next? I wanted to provide jobs to family and friends. I’ve been in situations where I’ve been giving them cash handouts, and I just see how that becomes crippling to people. I want to put people in a position where they can grow. When God takes the breath from me and I leave this earth, they can still continue to be successful. It’s opportunity, and that’s what I really want it to be. I’ve employed family members. I’ve employed people that went to school with my father. I’ve employed my best friend’s sister. I own five Subways, two Starbucks, two Einstein [Bros. Bagels], two 800 Degree (Woodfired Kitchen locations]; one is currently opened, and one is opening. I’m not an owner, but I also invested in a Chick-fil-A. But if I lose my identity, then money means nothing. And Miami has allowed me to keep my identity no matter what. People talk about security and going different places. You go anywhere in my city … and it’s all love, and I love that.